Cold Spring Press, 9781593602024, 149pp. 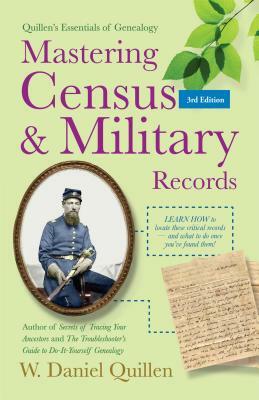 This book covers the use of two of the most effective sets of genealogical information available to genealogists: Census and military records. Topics include: - Federal censuses: what they are, how to use them, pitfalls and issues concerning the information found in them; - Mortality schedules: a frequently overlooked gold mine of little-known genealogical data; - State censuses: genealogically rich resources - Military records: where and how to find them, what information is available - War-by-war records availability. W. Daniel Quillen is the author of the now-classic and much-praised "Secrets of Tracing Your Ancestors" and "The Troubleshooter's Guide to Do-It-Yourself Genealogy." For nearly 30 years Quillen has been a professional writer specializing in travel and technical subjects. He teaches beginning genealogy courses to university students and working adults, and is a frequent lecturer in genealogy classes taught in the greater Denver area. There are now six titles in 'Quillen's Essentials of Genealogy' series, with more to come.